At the end of 2010, I suffered two heavy-duty losses—the loss of a job and the loss of my Father. Both happened around the holidays, so I went into 2011 feeling the lossess just as intensely as if they’d happened that year. 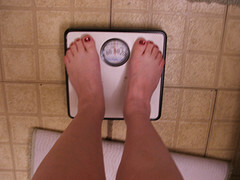 However, I had one major gain that has lasted me throughout the year, and that is my weight. Oh, I completely understand that the gains came from a whole lot of comfort food. Honestly, I don’t regret one single pound of it. I relished every drink, every darned good meal, and every single red velvet cupcake with cream cheese frosting that crossed my lips and made their way to my waistline. Yet when I stare at my closet and see my wardrobe shrinking as a consequence of my expanding…..well…..
About three weeks ago, I joined a gym. I went for the first time, the other day, and it felt pretty good to spend about half an hour on one of the treadmills, speeding along at 3 mph. I’m proud that I broke a sweat, and didn’t have any residual soreness the next day. I see this whole gym thing as a way of viscerally marking the end of my time of mourning for both the lost job and lost Dad, which had already happened emotionally after a visit to my sister’s for Thanksgiving. So, there’s really no reason for me to keep this little 10 lbs of spare tire I created over the past year. Its purpose, as perhaps a comfort during the process of grieving, is complete. Now, it’s just an annoyance that makes me spend my money on stuff like new tights with an expanding waistband and bigger bras. Come hell or high water, I’m planning to shed the pounds in a manner similar to the way I shed my grief: slowly, and steadliy, with lots of appreciation for the process. Hi Tish: In my world, the only way that exercise works is if its fun. I wrote about the healing qualities of exercise in my posting http://www.vixendivorcee.com/2011/11/22/solace-for-a-grieving-heart-2/#more-228. Be sure to look at the French take on exerise imbedded at the end. It’s clever as only the French can be. Good luck with taking off that weight. Slow and steady is the best way! Great that you’re being gentle with yourself. There isn’t enough kindness in the world, and so often it starts with not being kind to ourselves. Thanks Toby! IMO, women tackle the weight loss thing with all the dread of a tooth extraction. Totally counter-productive because, while a tooth extraction is temporary and quick, losing weight isn’t. Not to mention that sometimes we have to realize why we gained it in the first place, if there’s no medical reasons for it. Always rule out true medical reasons–like potential hypothyroid–before anything else with weight loss. Darned thyroid can go at any minute, as I found out years ago. Once you know any underlying health things, you can then hit the emotional. Mine were pretty easy to determine because they were like a one-two punch leading to a TKO. Tish – thanks for reminding us of the learnings we derive through the “process of living.” Inspirational!